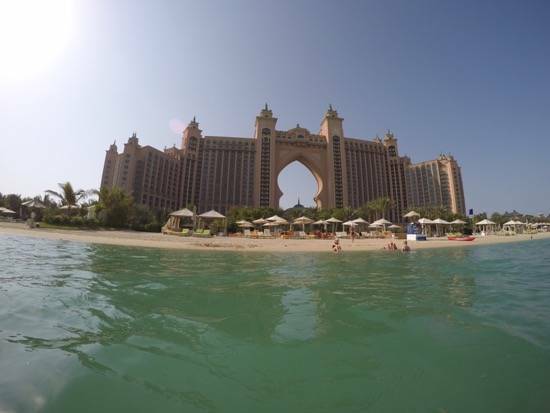 Finally, I made it to the world famous Atlantis – the Palm Dubai. 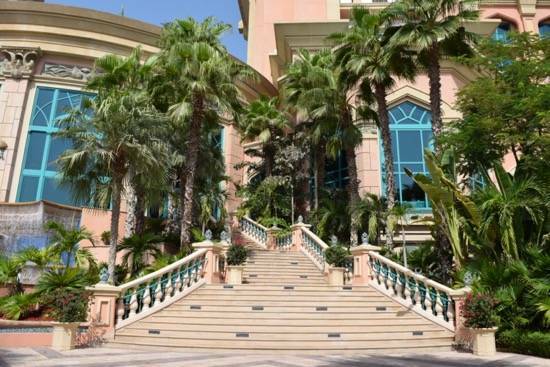 I had passed this impressive hotel several times when I stayed at another hotel on the Palm in Dubai. I was always interested in checking out the hotel but never did. So I was more than pleased when my two nights stay was confirmed on my trip in October. 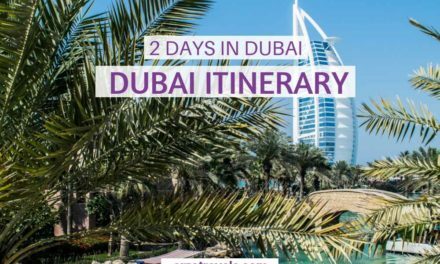 Where to stay in Dubai? 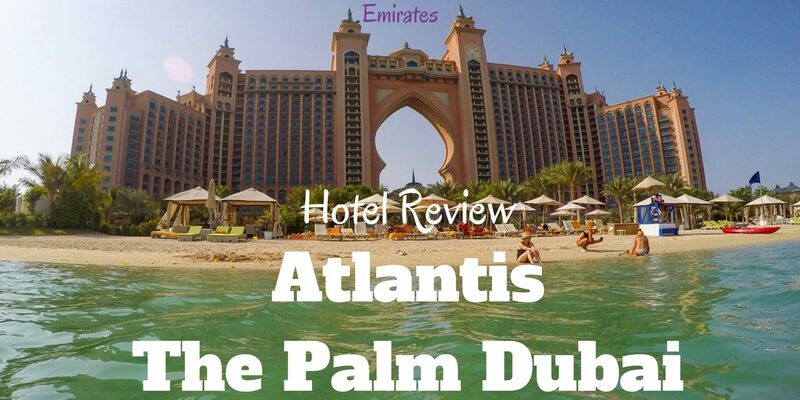 Read my hotel review: Atlantis Hotel – The Palm Dubai. 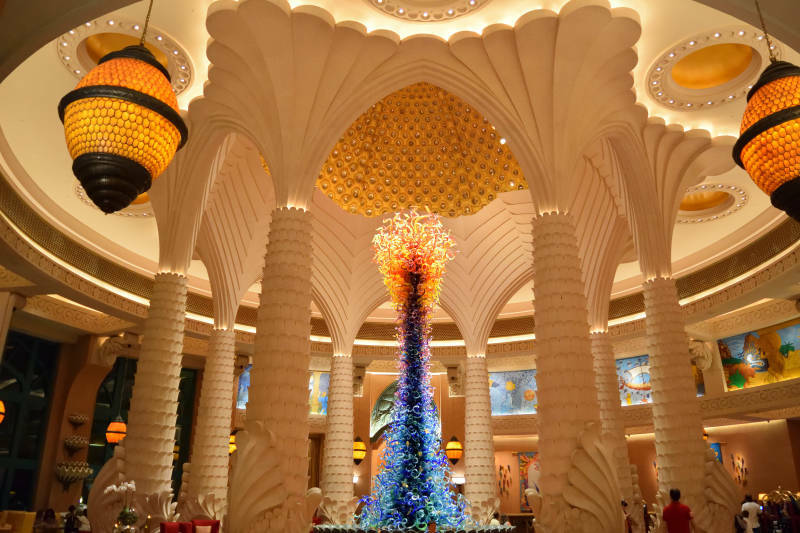 What to do and what to expect when visiting Atlantis – The Palm? 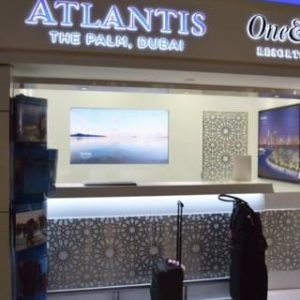 I arrived at the Dubai airport very early in the morning and was happy when I spotted the Atlantis counter at the airport. 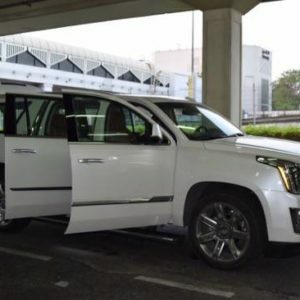 I had a hotel transfer, and a car was already waiting for me to bring me to the Atlantis. Some cold water and wet tissues were provided and the driver was very nice and friendly. When he noticed that I was sick he offered to stop at a pharmacy so I could get some medicine. Though the drive was pleasant I was glad to arrive at the hotel 35-40 minutes later. Since I had an early arrival, I had arranged an early check-in. The lobby was, of course very impressive and huge. 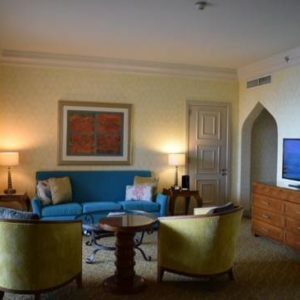 It was quiet though still busy and I checked in at the Royal Majlis. One of the very first things I noticed was the extremely friendly staff everywhere. The driver, receptionists, concierge, valet service- all were very friendly (which is not always the case in such big hotels). 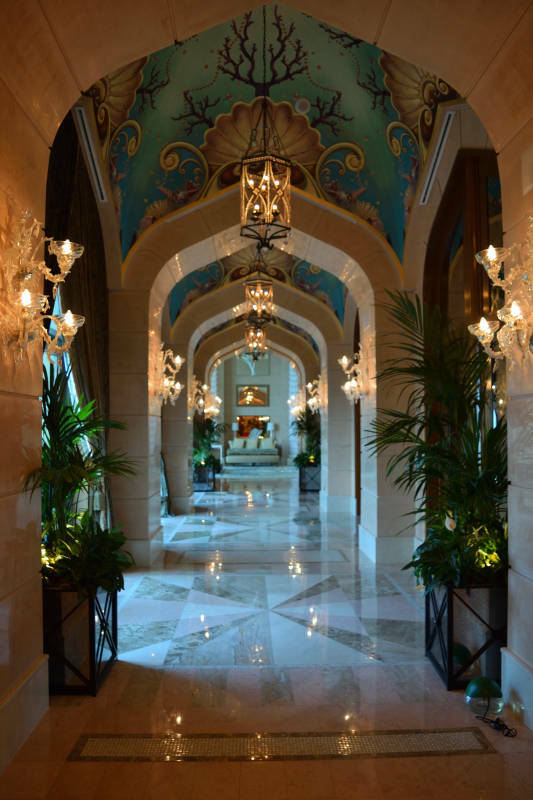 When you first arrive at Atlantis, you might have to be careful not to get lost – the hotel is just that huge. 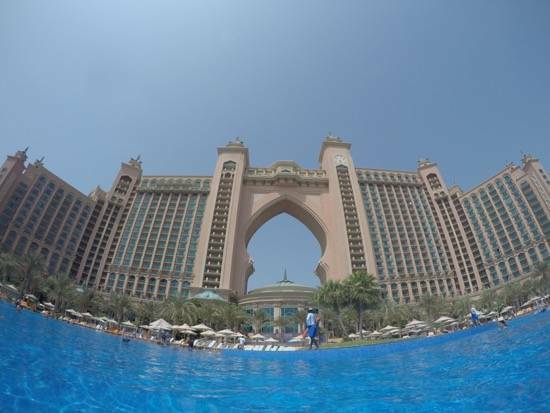 Atlantis is surely one of the biggest hotels in Dubai. 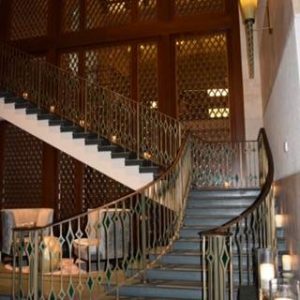 My room, a Terrace Club Suite, was located in the West Tower where I, then, headed with the concierge. After a “short” walk, I arrived in my room. The first thing I noticed was the huge balcony and the great view. The room itself was very spacious. There was a guest toilet and an own dressing room came with it. 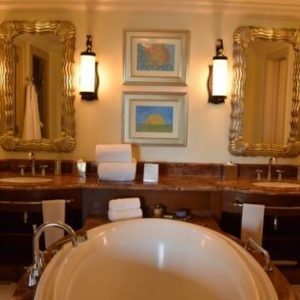 The bathroom itself was also very big, and so was the jacuzzi. 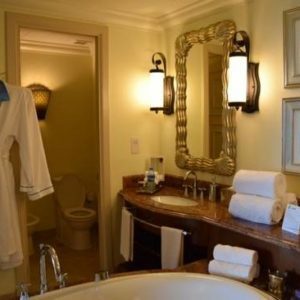 The toiletries were, as I am used in Dubai, very comprehensive (even some dental floss) and generously dispersed in the bathroom. The balcony was also large with a table, some chairs, and two sun loungers as well. To be honest, it was not all the newest furniture and you could see some signs of usage. But I was still more than happy with that room and view. As is common in Dubai, you get some complimentary bottles of waters to your room every day. It is just a small thing but I think it should be standard throughout the world. 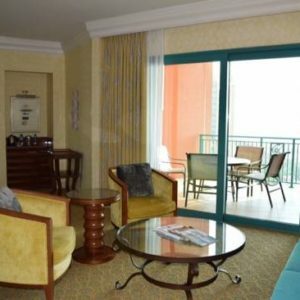 The rooms at Atlantis seem great but, in all honesty, there are a bit oldish. You can see pieces worn-out – while I like that fact, that nothing gets wasted here, it is weird to see that they don’t put much effort to change a few things. Do you want to enjoy luxury but still need to watch your budget? Then a smaller room (Deluxe Guest Room) would surely be a great choice as well. Do you like it even more luxurious? you could book the Royal Bridge Suite (for about $30,000 a night) or the Underwater Room for about $15,000 a night. I was lucky to have had the chance to visit both suits and neither disappointed. I absolutely fell in love with the most gorgeous hallway ever – really ever :). 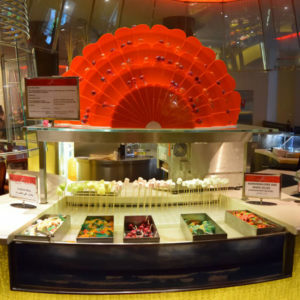 I had breakfast at both restaurants – Kaleidoscope and Saffron. I did (as always) some research about the breakfast. I read only one major difference between them was except that Saffron was more “Asian” than Kaleidoscope. Saffron is also bigger and louder but offers more variety of bigger choice. 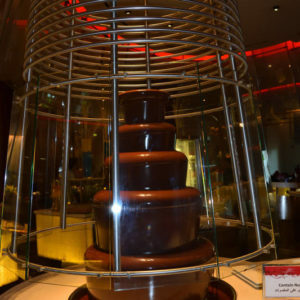 It also has a huge chocolate fountain (this is surely not typical Asian). I found many of the same dishes and things the other day at Kaleidoscope. There were waffles, pancakes etc. were exactly the same but with fewer choices. 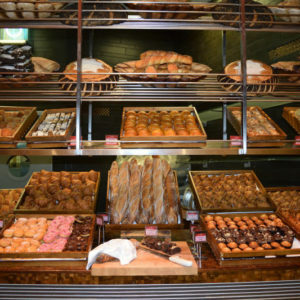 However, the choice is still incredible for a breakfast. Hot & hearty food as well as healthy food and whatever you could ask for. Kaleidoscope is smaller and I think the atmosphere is more pleasant. 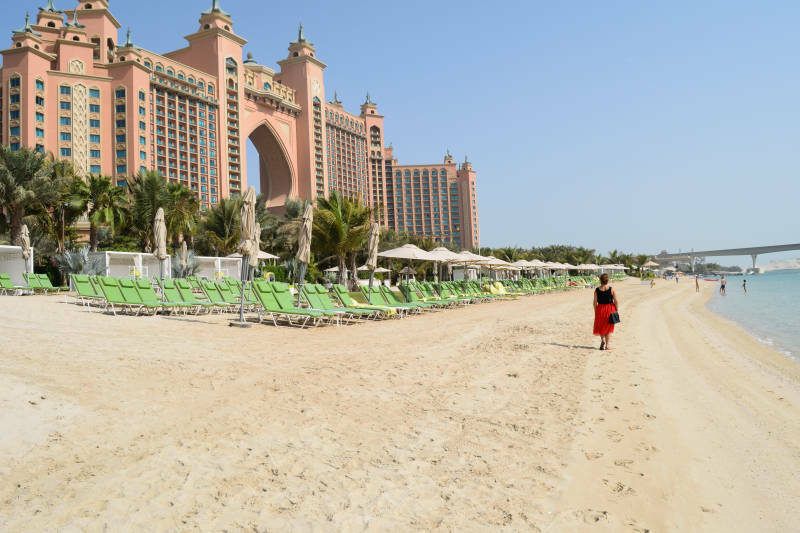 If you spend more than one night at Atlantis, try out both and see which you prefer – more variety and sweets versus a more pleasant atmosphere. 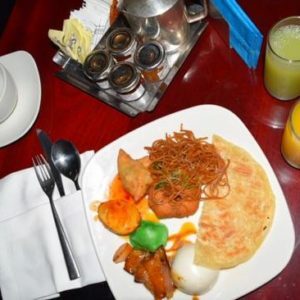 It is hard to judge which restaurant has a better breakfast. 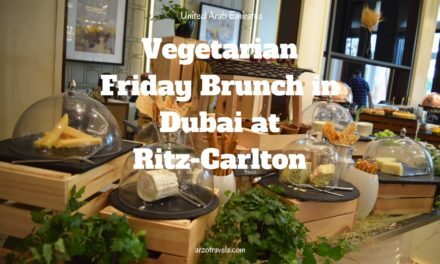 Both Kaleidoscope and Saffron, definitely offer enough options for vegetarians. I did not check out the vegan options though. 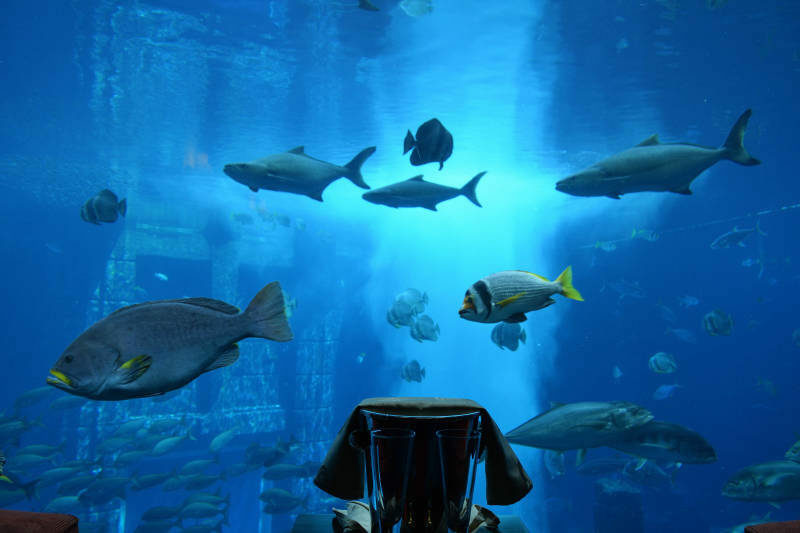 There are a lot of restaurants at Atlantis. I am actually not sure how many but you can be sure there are enough restaurants and delis that you will always definitely find something to enjoy. I tried out four of them. 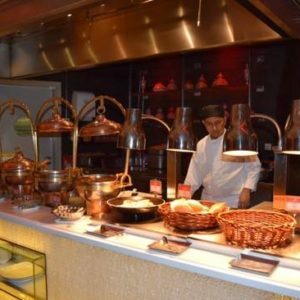 Nasimi Beach Restaurant, Ayamna Lebanese Restaurant, Bread Street Kitchen & Bar, Ronda Locatelli plus the previously mentioned two for breakfast. 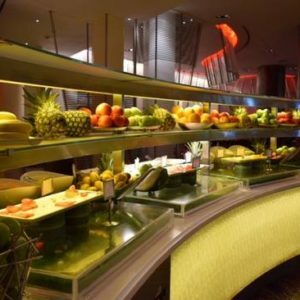 Find out more about those dining options here. There are several pools and when I visited in October they were not full. It was very pleasant because at no time it was crowded so I really enjoyed the quiet time there. However, it might get busier in winter. I, personally, like the beaches on the Palm much more than on Jumeirah. The Palm beach is completely private and thus more secure and quieter, but also prettier. There were enough sun lounges etc. 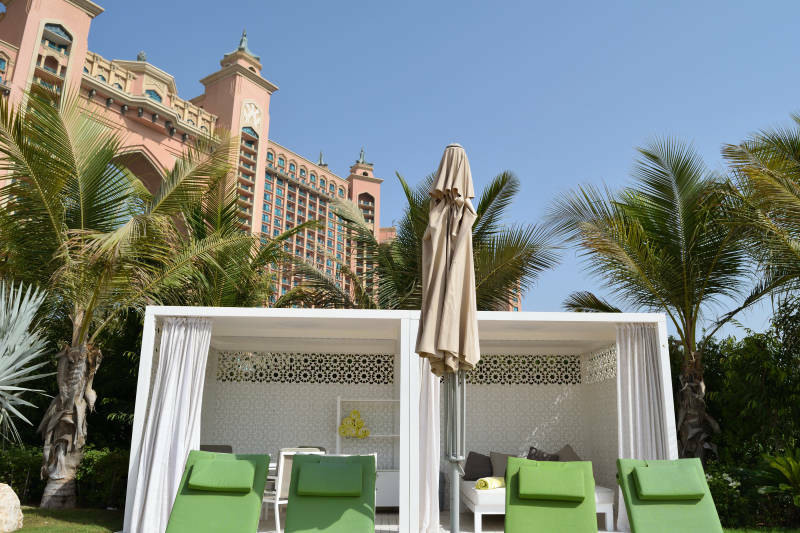 but for a more luxurious stay, you can book a cabana which costs extra. Of course, Atlantis has more to offer than the beach and pools. 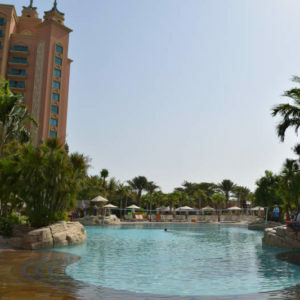 The Aquaventure Park is one of the biggest water parks in Dubai/the Emirates and as a hotel guest, the entrance is free. You just have to pay for the lockers. If you are feeling a bit lazy or just enjoy being driven around you can hop in one of the buggies that will take you from there the beach/pool area. The park itself is big and has several water slides. Some of them pretty crazy like Poseidon´s Revenge, which is basically a free fall. I was trying out several slides but also just enjoyed floating around in the floating ring. Since you can purchase snacks etc. it is definitely a place you could easily spend the entire day without getting bored. That goes for adults as well as for children. 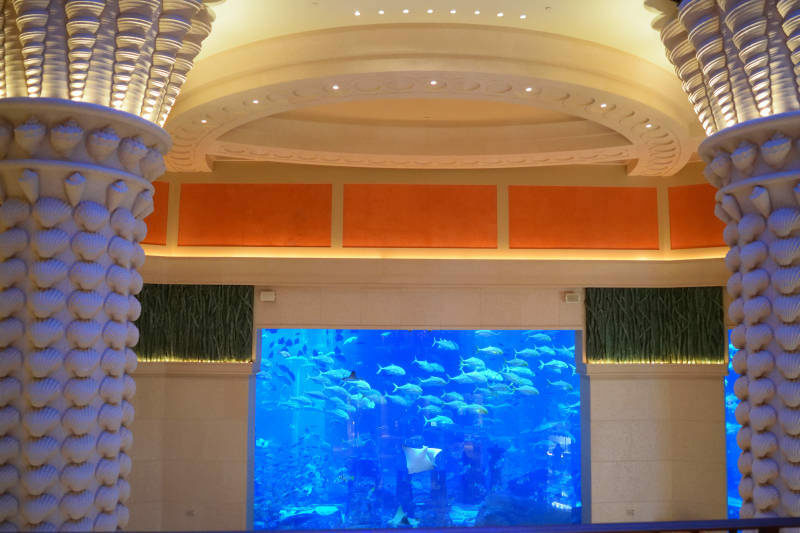 In general, I regard Atlantis as a very child-friendly hotel in Dubai. The Aquaventure Park is known as the best water park in Dubai, I have not visited any other so I cannot second that. But I can attest that it is fun for everybody. 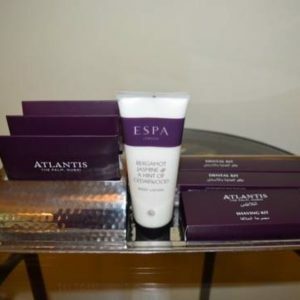 It is fin if you are a guest of Atlantis – however, I am not sure if I would pay that much money – it is overpriced and expensive as a non-guest. 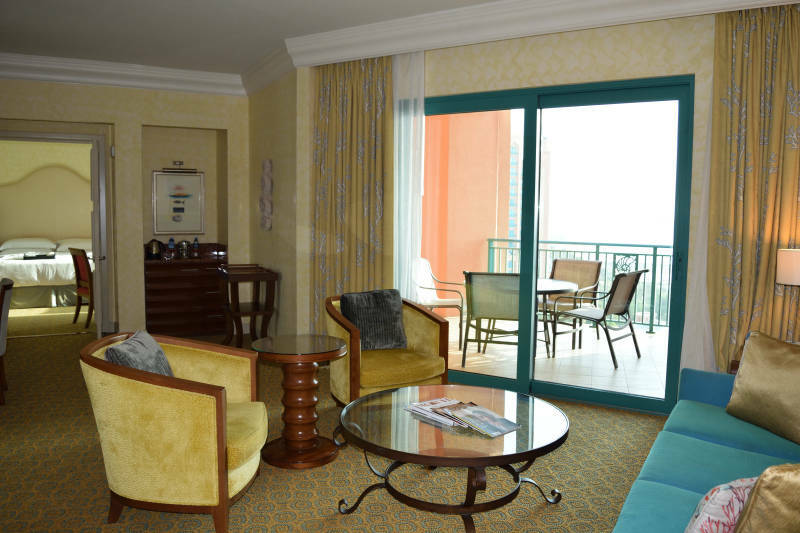 Click here for prices if you don’t stay overnight at Atlantis. It is an underwater world and according to the myth “lost for thousands of years deep beneath the sea, the ancient ruins of the lost city of Atlantis have finally been uncovered”. 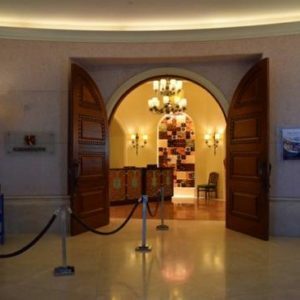 As a guest, you enjoy free entry. On my last day (and surprisingly late for me), I checked out the spa. 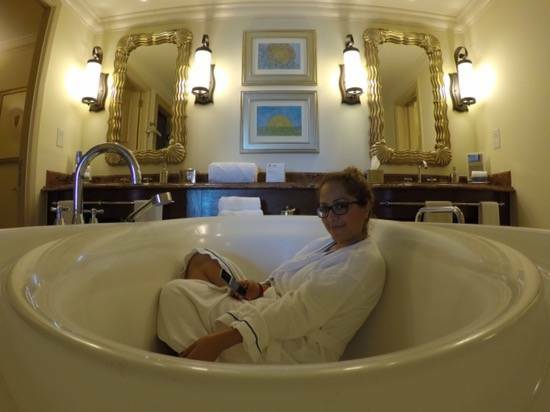 Though I did not have a treatment, I hopped into the jacuzzi which I had all to myself. 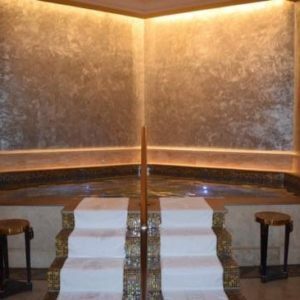 I expected it to be a bit busy but the spa area was positively quiet and exactly how a spa should be. Girls, they even provide a hair straightener. Of course, this is not everything. You can dive, visit and feed sea lions, do water sports, shop, enjoy a spa or beauty treatment and much more. 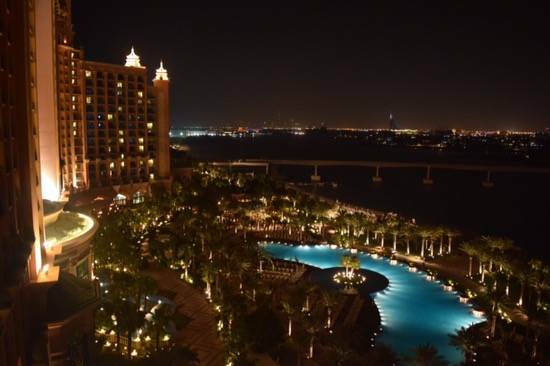 Atlantis is one of the most expensive, but also the most top hotels, in Dubai. 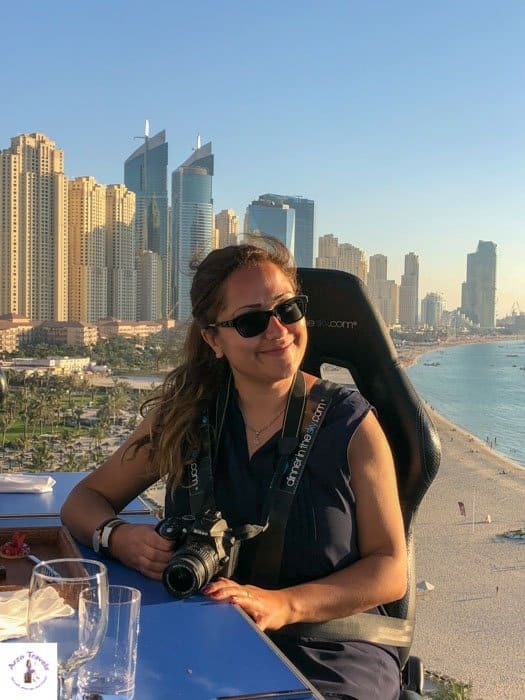 After staying in several hotels in Dubai, I can say it is definitely the most fun hotel I have stayed at in that area. For the first time ever, I did not leave a hotel property for more than 48 hours. I have always, always left a property (even the All Inclusive hotels) just because I like to leave and go “outside”. However, I think, though I spent there more than 48 hours, my time was a bit limited. I easily could have spent more time at Atlantis without getting bored at all. While it is a bit old, it is still a fun hotel. If money is not a big thing then book your stay here – if you watch your budget, you can book a cheaper hotel and spend that money on other activities. 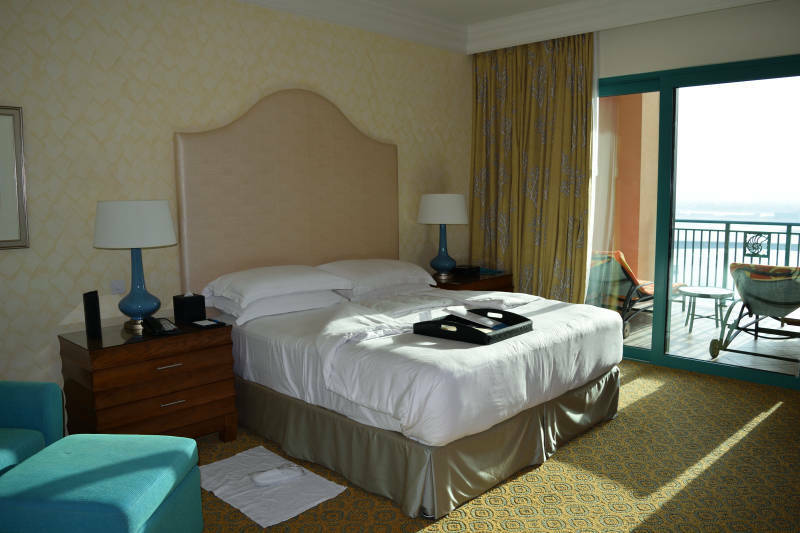 Click here for the best rates at Atlantis – The Palm. 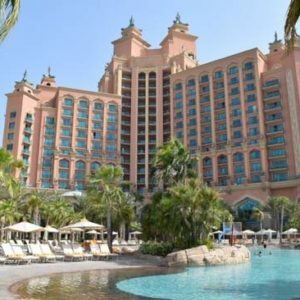 Where to stay in Dubai with children? Though I did not visit it with a child I also assume it is very child-friendly and a place for the whole family. 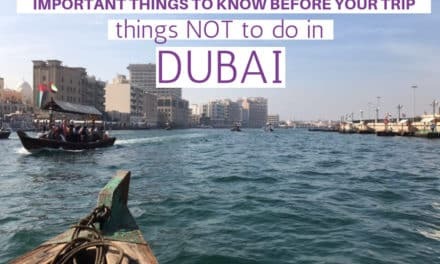 Disclaimer: Atlantis – The Palm Dubai invited me to stay as their guest but, as always, opinions are my own. If you are curious to find out about the Atlantis in the Bahamas? Then read this post to see what the Atlantis in the Bahamas is like.